As a service to the community, the Birmingham Public Library provides some copies of current federal and Alabama tax forms, instructions, and publications. 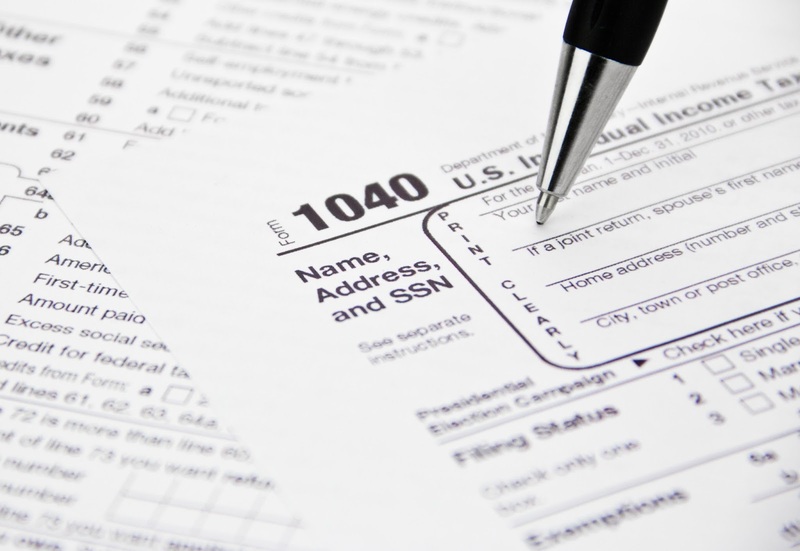 The following 2018 forms/booklets are currently available at the Central Library: federal – 1040; state – 40 and 40NR Alabama tax booklets. You can pick up a form or booklet at the Information Desk in the East Building and in the Government Documents and Southern History Departments in the Linn-Henley Research Library. Some BPL branches may also have forms. Please call the department or Birmingham Public Library branch to make sure that the form(s) you need is available. All forms and instructions can be found online at IRS.gov. 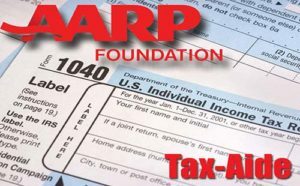 AARP Foundation Tax-Aide is offering free individualized tax preparation for low-to moderate-income taxpayers—especially those 50 and older. Starting February 1, call 205-226-4000 to make an appointment; no walk-ins will be assisted. Important documents to take with you. You don't have to be an AARP member, and there's no age requirement to get tax help from IRS-certified volunteers. 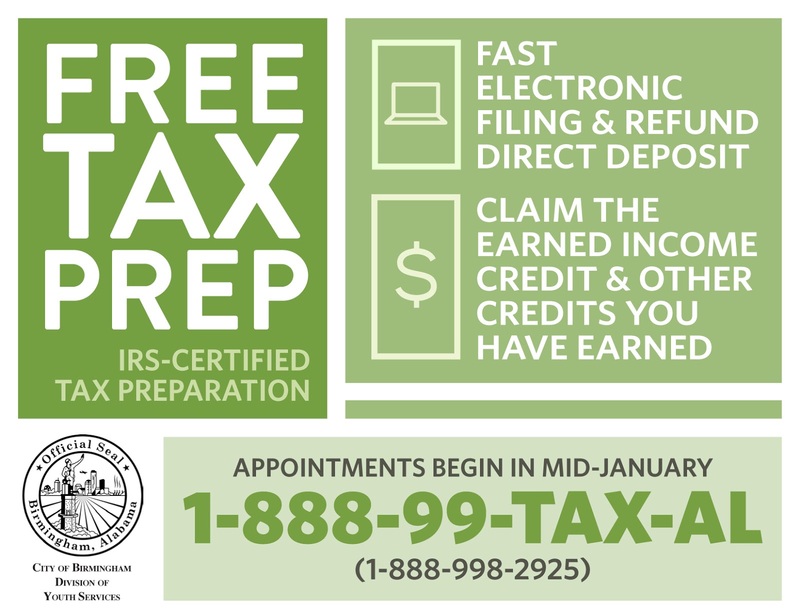 Wednesdays and Fridays, 9:00, 10:00, and 11:00 a.m.; 1:00, 2:00, and 3:00 p.m.
Impact America provides free tax preparation services for households earning up to $55,000* with one or more children in the home, or $20,000 without children in the home. 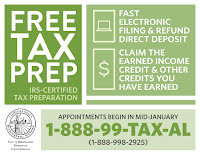 You must call 1-888-99-TAX-AL (1-888-998-2925) for an appointment; no walk-ins will be assisted. Services are provided by IRS-certified Volunteer Tax Preparers from local colleges in the cities where their tax sites are located. Impact Alabama is sponsored by SaveFirst. Schedule an appointment and find out what important documents to take with you. 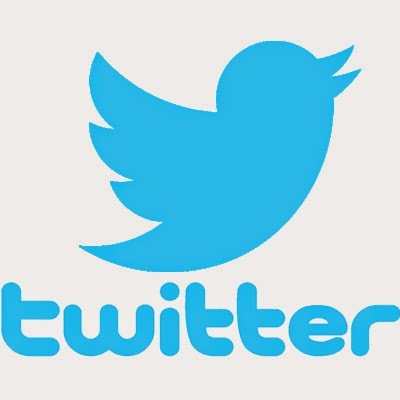 Mondays, Tuesdays, and Saturdays, 9:30 a.m.–12:00 p.m.; 2:00–5:00 p.m.
Mondays and Tuesdays, 11:00 a.m.–6:00 p.m.
Saturday, February 2, 9:30 a.m.–12:00 p.m.; 2:00–5:00 p.m.
Mondays, Wednesdays, and Fridays, 9:30 a.m.–12:00 p.m.; 2:00-5:00 p.m.
Saturday, March 2, 10:00 a.m.–4:00 p.m.
Tuesdays and Thursdays, 12:00–8:00 p.m.
Tuesday, January 22, 2:00–8:00 p.m.
Thursday, January 24, 2:00–8:00 p.m.
Saturday, February 16, 9:00 a.m.–1:00 p.m.
Tuesday, February 19, 4:00–8:00 p.m.
Mondays, Fridays, and Saturdays, 9:00 a.m.–1:00 p.m.; 2:00–6:00 p.m.
Wednesdays, Thursdays, and Fridays, 12:00–6:00 p.m.
*Some promotional materials may show $54,000 as the income cutoff line. The current income cutoff line is $55,000, but it is a general requirement and may mean that you qualify for the free service if your income is in that range. Call 1-888-998-2925 for more information.